It's been in the 80's here for the last few days and we're all hanging out in the air conditioning as much as possible. It's been miserable! I feel awful for the animals, they just seem so uncomfortable in this heat. We were sitting outside eating yogurt Popsicle's and the dogs were begging for them when I started to think about whether I could give them one or not. One thought leads to another and I decide that I can make them some dog safe popsicle's. We have 3 dogs, 2 small and 1 large so I got out 2 different sizes of disposable cups. 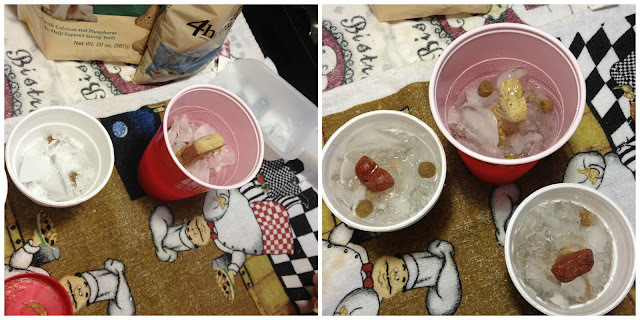 I used a small pack of dog food I had gotten as a sample, some crushed ice, a few larger bones and some peanut butter. I layered the ice and bits of dog food with a dab of peanut butter here and there then filled them all with cold water. I put them into the freezer until solid. When we peeled the cups away and gave them to the dogs they were so excited! Lulu took hers and ran to the side of the house to eat it in peace. Ashley and Bear sat on the patio but kept trying to steal each others! I've made them several times since then. I added over-ripe banana slices, some pureed pumpkin, mixed a little beef broth with the water...all kinds of different things that they like. It's really helped them to beat the heat this summer! It is...and the best part is that you can add whatever your dog likes! Try it...they will love it! I feel bad for my dog, too, especially since we don't have air conditioning. She loves to lay on the cold tile. This would be great for her! OUr crazy dogs love to sit outside even though we do have ac! lol Crazy, right? Try it, your dogs will love it! What a great idea. We need to make these for our dogs. We are featuring it at this week party Wednesday's Adorned From Above Party tonight. Have a great week. Wow, what a great treat for the dogs. I put peanut butter in kongs and freeze them and they love them. I am a new GFC. Great idea! I'm going to try that! Heading over to check out your blog now! You should try it! I love your hop!